On the back of the photo, someone had written “Toastmistress ESWC Banquet. 1. Ann Johnson. 2. Flossie McDowell. 3. Sally Reznichek.” Without that note we would not have these women’s full names. The club thanks Sharon McDowell for surprising us with this photo treasure for our November meeting on the East Side Women’s Club. This photo, along with 5 others, was published on the society page of the Wisconsin State Journal on Sunday June 8, 1941. 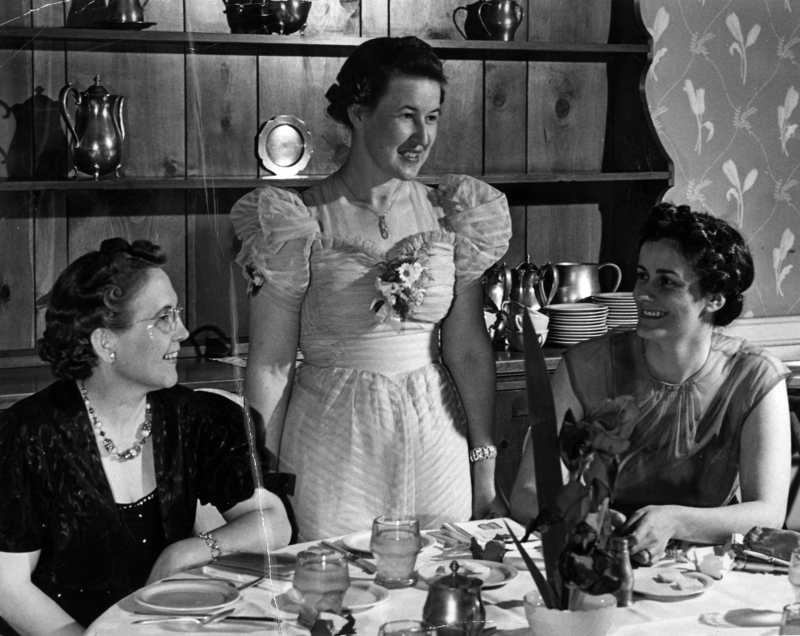 The photo spread described the annual Spring Banquet, held on Tuesday June 3, 1941 in Langdon Hall, the private dormitory at 631 Langdon Street. The caption for the photo reads: Mrs. Earl McDowell, newly elected vice-resident and toastmistress, started off the program with a smile. Mrs. Henry Johnson left, and Mrs. Cyrus Reznichek, right, corresponding secretary, smile with her. The article mentions that Mrs. Browne and Mrs. Crosby, who then was Alma Hall, organized the club in the fall of 1925 as a “community” organization. Mrs. Browne was the first president. Mrs. Crosby was living in Hollywood in 1941 and works in the movies. She appeared in such productions as “In Old Chicago”, “Doomed Battalion” and “The Good Fairy”. By coincidence, the photo that Nettie Slickman Spevacek contributed to An East Side Album (page 9) was also a part of the June 8th, 1941 photo spread. More information about the East Side Women’s Club will appear on this blog soon. 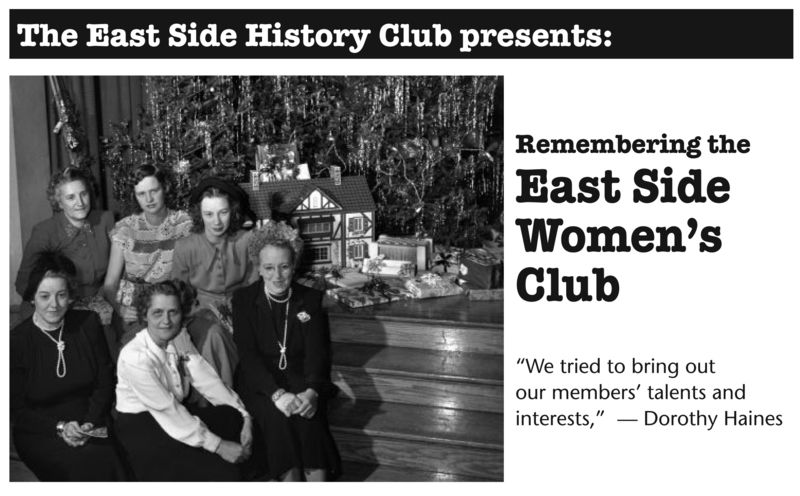 If you have East Side Women’s Club memorabilia, please let us know, by commenting on this post. We’d love to capture more images like these. 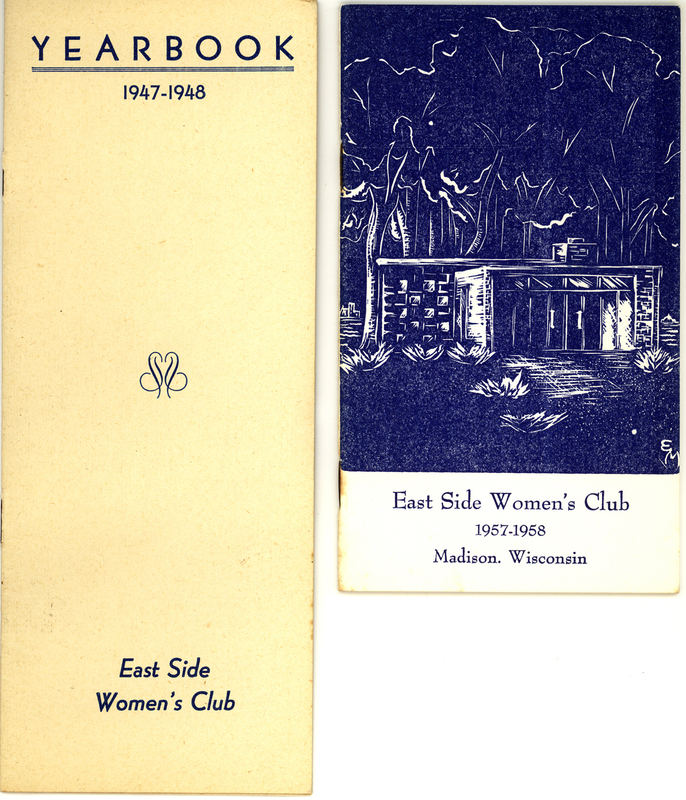 The East Side Women’s Club was active in community improvements and philanthropies on Madison’s east side. Dorothy Haines, active participant and daughter of founding member Vera Browne, will lead discussion about the East Side Women’s Club events and activities. Bring your memories and memorabilia. Dorothy is seeking copies of Women’s Club publications to complete her files. If you have copies, please bring them for scanning. Any items donated will become part of the East Side Women’s club archives located at the Blooming Grove Historical Society. On November 11th we celebrate Armistice Day, and remember life on the home front with this Armistice-themed promotional item found in a storage space in the building at 2007 Atwood Avenue that once was home to the Strand Baking Company. We wonder what bakery supply company distributed these pamphlets for imprinting by local businesses? The copy exhorts us to "Celebrate Armistice Day with a tried-and-true All-American dinner! Dish up big helpings--we Americans still can. And for desert...Beautiful, star-spangled AMERICAKE!" A Dorothy Lamour-themed Valentines Day “Sweetheart Cake” piece was found too–we’ll save that to share next February. Thank you, Sean Nashold and Denise McKay, for contributing these little gems to the East Side History Club’s collection.